Vitamin B-12 is an important vitamin that is hard to receive in adequate amounts as we age. And, therefore, as we enter menopause. As we near 45 years, the changes in our body make it even more difficult to properly metabolize this important nutrient. 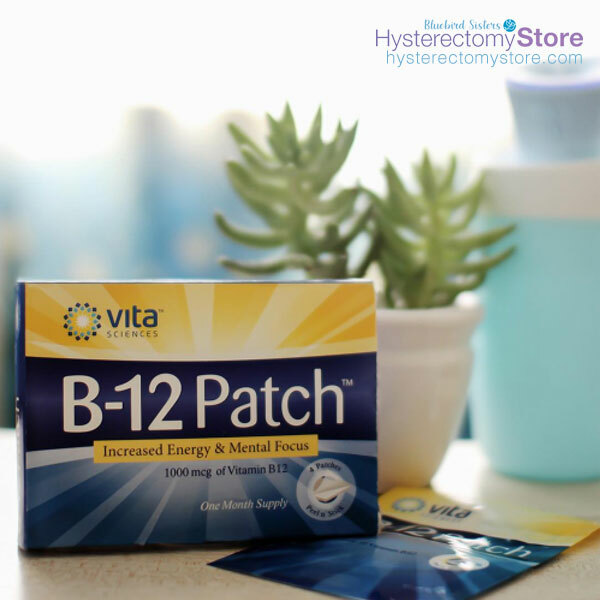 In the Hysterectomy Store, we’ve discovered the B-12 patch is a great way of getting the B-12 our body needs. The B-12 patch is placed behind the ear, for 24 hours, once a week. The box contains 4 patches – for one month’s supply. Read more about the B-12 Patch here. Enjoli, a customer says: Love the patch! So far, I don’t seem to need my B-12 injections now that I have switched over to the patch. I am not a fan of shots, and this product is even less expensive than my copay! We think you will love this product! This entry was posted in Featured Products and tagged B-12, menopause, patch, product on November 2, 2018 by Bluebird Sisters.